Our aluminum anodes offer predictable offshore performance. 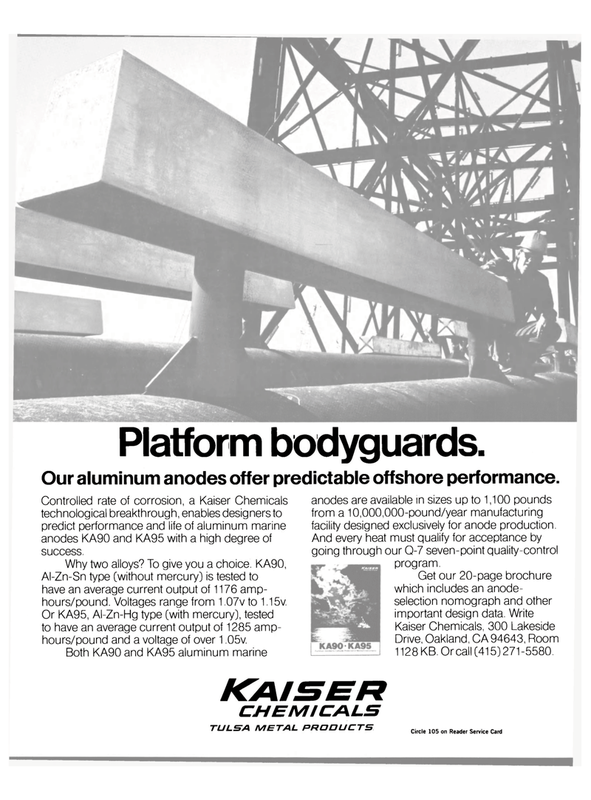 Controlled rate of corrosion, a Kaiser Chemicals technological breakthrough, enables designers to predict performance and life of aluminum marine anodes KA90 and KA95 with a high degree of success. Al-Zn-Sn type [without mercury} is tested to have an average current output of 1176 amp- hours/pound. Voltages range from 1,07v to 1,15v. Or KA95, Al-Zn-Hg type [with mercury), tested to have an average current output of 1285 amp- hours/pound and a voltage of over 1,05v. Both KA90 and KA95 aluminum marine anodes are available in sizes up to 1,100 pounds from a 10,000,000-pound/year manufacturing facility designed exclusively for anode production. And every heat must qualify for acceptance by going through our Q-7 seven-point quality-control program. Drive, Oakland, CA 94643, Room 1128KB. Or call [415)271-5580.